Heat coals or gas grill for direct heat. Grill pizza crusts, top sides down, 4 to 6 inches from medium heat 3 to 5 minutes or until light brown. Remove from grill. Spread pesto over grilled side of crusts. Top with artichokes and tomatoes. Sprinkle with cheese. Cover and grill about 5 minutes or until cheese is melted. Cut each pizza in half. 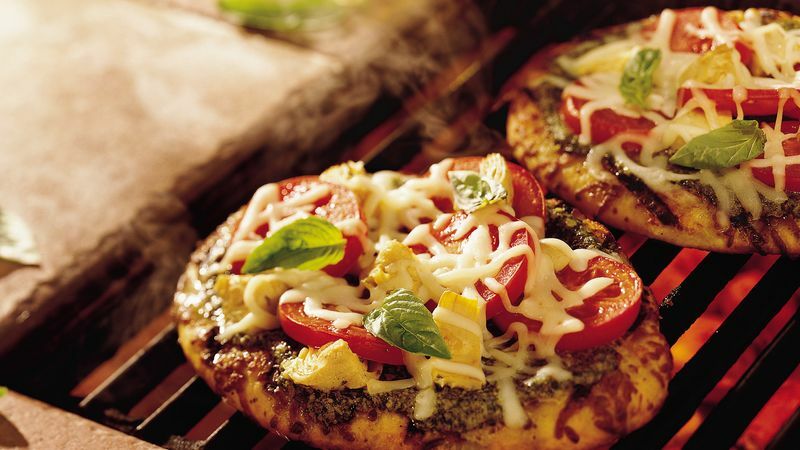 Serve this easy grilled pizza as an appetizer. Simply cut each pizza into 8 wedges and serve. Just before serving, sprinkle the pizza with chopped fresh basil.